TRUTH VIDEOS FROM WEB - Website of simonsaysbiz! Hi Simon Yes you have it right. Whitlam and the Political Parties twice removed the people "of the Commonwealth" from their system of Government then removed all our property so they could borrow against their Australian Dollars counterfeit to the Commonwealth of Australia Constitution Act 1901 Proclaimed and Gazetted. 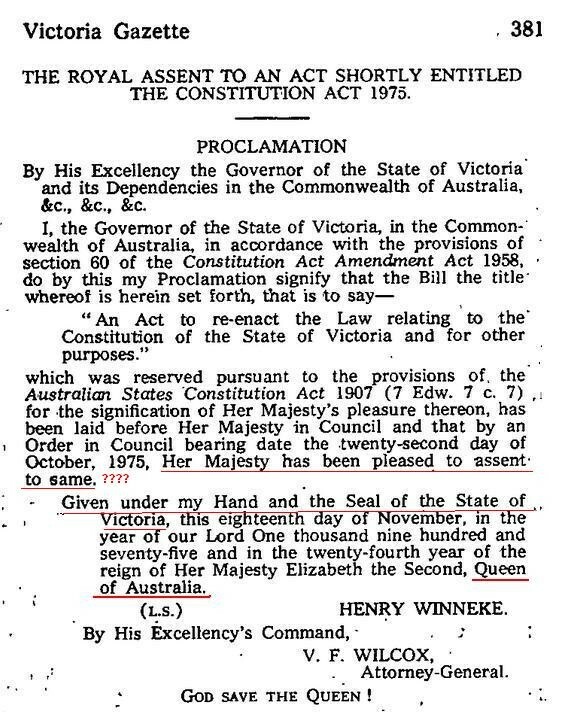 In 1901 we the people "of the Commonwealth" became a Constitutional Monarchy under the Commonwealth of Australia Constitution Act 1901 Proclaimed and Gazetted. In 1999 we the people "of the Commonwealth" at a referendum voted to stay as a Constitutional Monarchy. Therefore our money should be Instead we are forced to use Political Party counterfeit pretend money which as their own private (Political Parties creation in 1979) High Court of Australia states the Australian Dollar has NO Head of Power. See attachment The Political Parties removed most fire arms for a major reason and it was not the crap that was rammed down our throat at the time. The Police Service whether Federal or State are the security agencies for the TOTALLY CORRUPT Political Parties and their TOTALLY CORRUPT Judicial system. They think their TOTALLY CORRUPT Judicial system is NOT accountable to the Commonwealth of Australia Constitution Act 1901 Proclaimed and Gazetted. When the people "of the Commonwealth" wake up ??? and enforce an election under the Primary Law of the Commonwealth as established under the Commonwealth of Australia Constitution Act 1901 Proclaimed and Gazetted. ​Whitlam and the Political Parties removed the words "of the Commonwealth" in 1973 from all Commonwealth Acts. Definition of Commonwealth, which is clear and unchallengeable, according to the express wording of the Preamble and the first six clauses of the Commonwealth of Australia Constitution Act 1901 Proclaimed and Gazetted. Preamble WHEREAS the people of 1. Short title Title removed 2. Act to extend to the Queen’s successors Removed any successors 3. Proclamation of Commonwealth Removed the Proclamation 4. Commencement of Act Removed the Commencement 5. Operation of the Constitution and laws Removed the binding to the Constitution 6. Definitions By removing definitions the Political Parties have created their own “Australia” their own “Commonwealth” means their own “Commonwealth of Australia” in a geographical system. By doing this the Political Parties have taken over the Commonwealth of Australia by using the Common Vernacular of words and the people "of the Commonwealth" are walking around with their heads jammed in the sand. As well as going over seas to international bodies we are trying to inform as many people "of the Commonwealth" as possible. At present we are writing up for the International Court of Justice and the Security Council of the United Nations and over seas Countries. Their TOTALLY CORRUPT POLITICAL PARTIES HIGH COURT OF AUSTRALIA created in 1979 explain very clearly that under their (Political Parties) system of Government we the people "of the Commonwealth" have NO rights. The Police services (PIGS) whether Federal or State are only a security agency to the TOTALLY CORRUPT POLITICAL PARTIES and their TOTALLY CORRUPT LEGAL FRATERNITY. Most conflicts, violence and injustice is a result not of individual malice but the peoples imagining they have an obligation to obey a perceived authority. usually government, in their daily lives. Most people accept the non aggression principle its not ok to rob or attack other people but they have been taught that government has an exemption from the rule and that legalised theft and thuggery, taxation and law enforcement are moral legitimate and necessary for society. Here are 3 independent proofs that the concept of government is not just susceptible to corruption and abuse but is by it's very nature self contradictory and insane. There is no document or procedure where by any person or group of people can delegate to another a right which the first person or group didn't have to begin with. Ergo congress cannot have acquired that which it does not have the right to do any thing, that you don't have the right to do yourself. You can't have a moral obligation to do what you think is wrong. Whenever there is a conflict between what authority dictates and your own conscience you have the right to disobey, but if that's true, than the one giving orders isn't authority since authority means the one with the right to rule you and the one you must obey. No document or ritual can alter morality and make an evil act good, either man made law matches objective morality in which case the law is redundant and irrelevant or it conflicts with objective morality in which case it is illegitimate and should be disobeyed. Either way legislation never creates any obligation to obey and therefore has no authority. Jagamara is a leader we all need to listen to. Been driving without a license for 14 years. How to transform Australia back to a common law jurisdiction. We all need to do this at the next election. This is our chance to get our country back. Posted by Ms Merchant of Doom on January 30, 2014 at 6:15 in Nuclear and its "Fallout"
The government and the nuclear power industry claim we have nothing to worry about. When you see the photos below, you may want decide for yourself if they're telling the truth. According to the Local Environmental Observers (LEO) Network in Hydaburg, Alaska, they have found strange growths in the flesh or meat of salmon. "We were fishing for cohos (silver salmon) at the mouth of the Hydaburg River with line and reel." said Brian Holter, Jr. who said that eight fish were filled up inside with strange growths that were either white or pink in color. "On the outside the fish looked fine. The growths looked kind of like individual little salmon eggs, and about the same size. Other people were seeing the same kind of growths in their fish as well." he continued. Other volunteers from LEO have come across even more disturbing cancerous tumors and bloody lesions on fish. According to another LEO volunteer, Sam Kunaknana, in Nuiqsut, Alaska, for the past few months they have been catching sick fish on Nigliq Channel and upstream from Nigliq Channel to the Colville River. The fish have had bloody lesions and tumors on them. While there is no way to tell exactly where in the Pacific Ocean these fish have been, one thing is for certain: they're ALL from the Pacific Ocean. Yet numerous "scientists" have repeatedly stated that "dilution is the solution" for the Fukushima pollution. These "scientists" say the Pacific Ocean is so big and has so much water, the radiation spewing from Fukushima can't possibly be bad enough to affect humans. The pictures in this story seem to prove those "scientists" wrong. Certainly, the Pacific Ocean is huge. Yet as the map above shows, distance from Fukushima did not seem to matter with the fish caught near Hydaburg, Alaska. The map below, shows the location of the other LEO volunteer, Sam Kunaknana, in Nuiqsut, Alaska, thousands of miles farther away from Fukushima than Hyanburg. In fact, Nuiqsut, Alaska is about as far north as one can get from Fukushima, but the radiation has gotten there too. If the strange lesions and cancerous tumors were only affecting Salmon, one might theorize that a particular disease had struck a particular species. That's not the case. As shown below, Alberta Pike are also being caught with grotesque cancerous tumors protruding outside their bodies. Vancouver Island Area Herring are also being found to be bleeding from their gills, eyes, mouths and bellies. HISTORIC FIRST: GREAT WHITE SHARK WITH CANCEROUS TUMOR! We've all heard for years that sharks don't get cancer. Well, when they swim around the Pacific Ocean nowadays, the radiation is so terrible that even sharks are getting cancer. "This was a very unusual sight as we have never before seen a white shark with tumors," said Rachel Robbins, a study co-author and shark biologist at the Fox Shark Research Foundation, near Adelaide, in southern Australia. As stated earlier, some have said that there are explanations other than radiation for these ailments. Certainly that might be worthy of consideration. Yet, how many of these so called "ailments" can cross-species? You see, it is not just fish being affected; mammals are too. Polar Bear: Losing hair is one of the first signs of radiation poisoning. The federal government of the United States of America has done absolutely NOTHING to test for radiation in the Pacific Ocean. Nothing. So, there you have it. For three years, the Fukushima Nuclear Power Plant disaster has been spewing deadly radioactive material into the Pacific Ocean and for three years, the agencies above have done nothing. Without admitting they have done nothing, NOAA wants $7098.84 to merely LOOK to see if they have any records relating to a request! In the meantime, fish from the Pacific Ocean are contaminated with -- and dying from -- Fukushima radiation and that means the radiation is in the seafood that YOU, your family, maybe even your cats and dogs are eating. The next time you hear anyone from government say "we have no reason to believe there is any radiation hazard" bear in mind it is because they are not testing for it. That's why they have no information . . . . . and . . . . conveniently . . . . "no reason to believe" there is any danger. If this situation wasn't so pathetic, it would be laughable. You folks on the west coast of North America might want to consider your activities this coming summer. Maybe if YOU go swimming in the same water these fish swam in, a couple years later YOU could come out looking like they look! As for everyone else, head-on-out to your local supermarket or restaurant and eat-up; the government says it's safe and they _never_ lie! MUST SEE Karl Lentz UnKommonlaw invoke queen's bench become i a man not a person & win in court !